A Canal Barge trip is a fun, relaxing and the original way to discover the Grand Canal. Get on board and discover the scenery, culture and history of the canal with the skipper as your guide. Scheduled cruises operate from March to October and you can charter the barge privately all year round. There are 3 cruise options and 6 departure times daily during peak season and a barge trip is suitable for all ages. The morning return cruise to Digby Lock departs at 10:00 and takes 2.5 hours. You’ll cruise over the Leinster Aqueduct and on through a 250 year old canal lock that works exactly as it did when first installed in the 18th century. 1 hour cruises operate throughout the afternoon and there's a stop on top of the Leinster Aqueduct where you'll learn about the history of the impressive structure carrying the Grand Canal over the River Liffey. 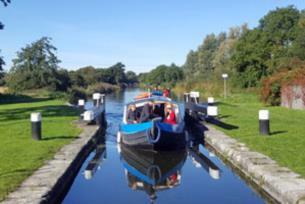 The McCreevy’s Lock evening cruise departs at 17:00 and 19:00. The barge is a lovingly restored traditional canal barge that is licensed to carry 12 passengers. It has a spacious comfortable interior with a wood burning stove, on board bar service and outdoor seating areas. You can combine your cruise with a meal in one of the waterfront restaurants in Sallins afterwards. Sallins is where trade on the Grand Canal first began when passenger and cargo barges started hauling their horse drawn loads between the small Kildare village and Dublin in 1780. Today it is a bustling inland harbour village with four award winning restaurants and bars on the waterfront, and there’s a flotilla of boats, barges and houseboats in the harbour. It is 30 minutes from Dublin city center with trains from Heuston station every hour. Advance booking online is essential.